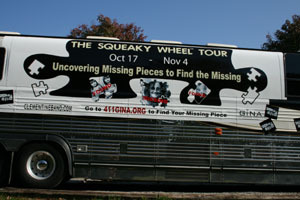 The International Squeaky Wheel Tour® (or SWT) presented by GINA for Missing Persons FOUNDation is an acclaimed concert series that raises awareness for those who go missing every year. This page is a listing of shows presented and missing persons profiled during the 2011 Tour. 143 North La Brea Ave.